The below artworks are the most important by Tina Modotti - that both overview the major creative periods, and highlight the greatest achievements by the artist. Artwork description & Analysis: Roses, Mexico, is an extreme close-up of four roses. Cropped to fill the frame from edge to edge, this is not a traditional still-life photograph of roses arranged in a vase. Here, the roses lay prone and slightly wilted, just beyond their prime, thus reflecting the passage of time and the ephemerality of delicate blooms. Much like a traditional vanitas still life that asked the viewer to contemplate mortality by reflecting on the fleeting nature of material objects, Roses brings this subject to modern photography. 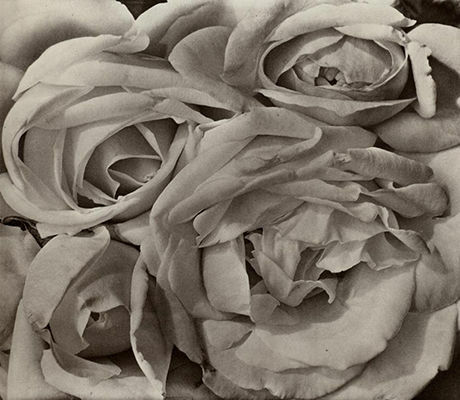 As photography historian Carol Armstrong notes, Roses "calls on the line of figural abstraction identified, not with [Alfred] Stieglitz, [Paul] Strand and the 'straight' photograph, but with Georgia O'Keeffe and her blown-up genital flowers, which like [Edward] Weston's single-object photographs reduced the flora still-life that had been the traditional purview of the female painter to one (or two or four) item(s), expanded to fill the entire field of the image." 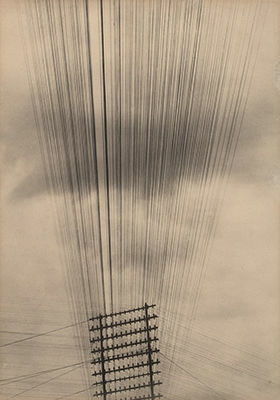 Artwork description & Analysis: In this 1925 photograph of isolated telephone wires, Modotti shifts the perspective, removing any reference to the ground that holds the telephone poles in place. Instead, the carefully composed image focuses on the angles and patterns produced by the wires and clouds, to create a work that mingles modernism and social concerns. During this period Mexico was undergoing increased modernization and industrialization, which Modotti symbolizes in her photograph of telephone wires. Modotti thus presents an optimistic view of Mexico's modernization and the promise of instant communication brought about by the installation of telephone systems that seemed to open up Mexico to the rest of the world. Lauded by the Mexican avant-garde group, Estridentistas, who aligned their work with the Mexican Revolution and sought to modernize Mexico, Modotti's photograph was included in their journal Horizonte because it represented dynamism, technology, and progress. The photograph's framing and its use of oblique angles and unusual perspective, brought it into alignment with other modernist painters and photographers, including Paul Strand, Charles Sheeler, and Charles Demuth, but also with European avant-garde photographers like László Moholy-Nagy, Man Ray, and Albert Renger-Patzsch. Although the tendency to focus on the subject/object was characteristic of her former mentor Edward Weston's work, Diego Rivera praised Modotti's work as "more abstract, more ethereal, and even more intellectual" than Weston's. 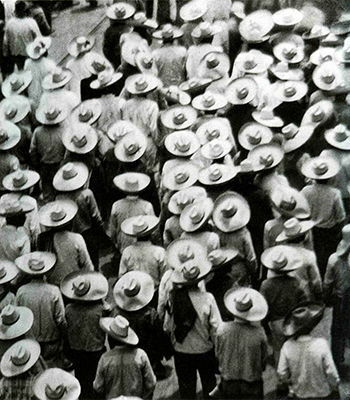 Artwork description & Analysis: A closely cropped image of a sea of sombreros, Workers Parade, much like her earlier photograph Roses, focuses in on the subject by eliminating all extraneous information. The politically charged subject matter, along with the unusual camera angle, attention to light and dark, and the texture and pattern produced by photographing the scene from above recalls the slightly later work of Alexander Rodchenko, and in particular, his Gathering for a Demonstration (1928). The ubiquitous sombrero would have been immediately recognizable to the Mexican viewer for its connection to the campesinos and trabajadores, the Mexican workers, who were gathered for the annual May Day parade in Mexico City. May Day, traditionally celebrated on the first of May, commemorates International Workers' Day, often with large parades and gatherings as a demonstration of solidarity among workers. This was a calendar event that Modotti had been familiar with since childhood due to her father's involvement in these very same parades. Among Modotti's earliest politically motivated photographs, Workers Parade brings together her formal concerns with her interest in using art to express her political beliefs and her desire to make her photography socially relevant. On a symbolic level, as noted by Sarah Lowe, Worker's Parade conveys the power of unity by "suggesting that the source of power to make political changes lies with the peasants." This photograph signaled a turning point in Modotti's work toward a new modern form of photography that addressed contemporary issues and events in order to instigate and effect change. 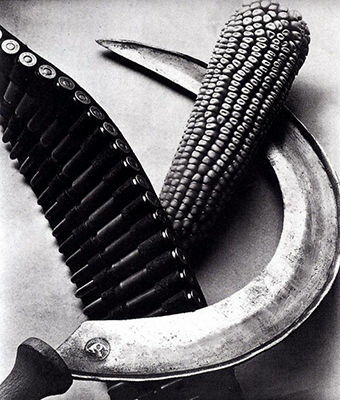 Artwork description & Analysis: A carefully composed photograph of a bandolier, an ear of corn, and a sickle, married Modotti's interest in the photographic still life with objects symbolic of Mexico and the revolution - the sickle, a popular Communist symbol, corn, a symbol of Mexico and its rural farmers, and the bandolier (a pocketed belt for holding ammunition), the symbol of the Mexican Revolution. Politically active after 1925, Modotti joined the Communist Party of Mexico (CPM) in 1927. Due to her Communist-inflected worldview, her photographs from the late 1920s took a decided turn toward Communist symbolism, in lieu of overt propaganda. As Sarah Lowe has stated, "her eloquent arrangements - founded on a stringent formal control - relocates the commonplace into the realm of the symbolic. They become potent revolutionary icons, offering a metaphorical union of artista [artist], campesino [farm laborer], and soldado [soldier], thus functioning as both formal still life and propaganda." 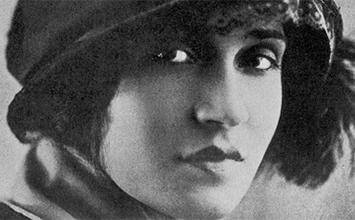 Lowe further suggests that in so doing, Modotti created a new kind of political picture. In this respect, Modotti's relationship with Frida Kahlo becomes more than a shared friendship, and also incorporates shared artistic practice. Kahlo also infused still-lives with political objects and slogans, and as such transforms a seemingly domestic process of making art into a highly charged political statement. Artwork description & Analysis: In this photograph of a peasant reading El Machete, the newspaper of the Mexican Communist Party, Modotti brings her careful attention surrounding composition, cropping, light and dark, and texture, to a subject with great social and political significance. 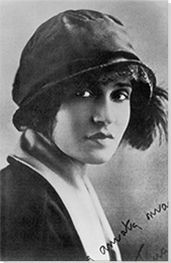 Modotti had joined the Communist Party of Mexico this same year after learning that Italy had fallen to fascism. She brought her revolutionary zeal to her photographs of the late 1920s, many of which she published in Communist newspaper El Machete, a newspaper for workers and peasants. Whilst many photographers of this period, including Edward Weston and Paul Strand, were focused on a romanticized view of a timeless Mexico, Modotti turned to her camera to its people and to the real effects of its ongoing changes. She often collaborated with workers to produce photographs that were intended to raise class-consciousness and depict their daily lives. 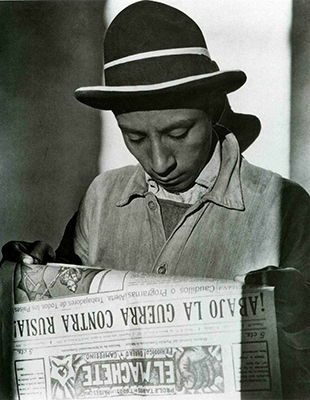 At a moment when new governmental education reforms sought to educate the lower and working classes in Mexico, a seemingly straightforward image of a man reading a newspaper also had subversive undertones, particularly to the middle class. As Sarah Lowe notes: "The young obrero reading El Machete is a reminder that the Revolution's promise of universal literacy would only be fulfilled by the activism of the people." Although she viewed photography through the lens of modernism, she also believed that photography was a form of mass communication and an important means of enhancing visual literacy. Artwork description & Analysis: In this iconic black and white photograph, a woman dominates the picture frame. Standing with arm raised holding a large gourd on her head, she gazes off to the right, somewhere out of the picture frame. She wears a circular pendant and earrings, and a traditional Tehuana dress with geometric patterns, the costume that has been so well made visible by the work of Modotti's friend, Frida Kahlo. The careful framing, cropping, and pose emphasize the image's angular forms. Shot from below to emphasize the woman's noble and heroic stature, the photograph was taken during a trip to Tehuantepec in Southern Mexico. 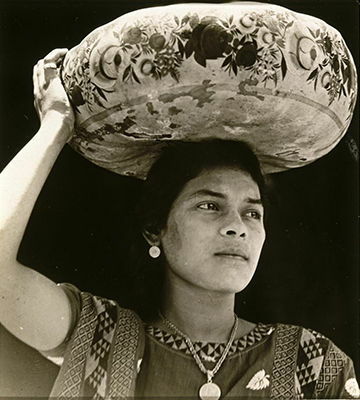 Unlike Modotti's earlier photographs, the photographs taken in Tehuantepec were largely unposed, typically street photographs that captured the daily lives of the women that lived there. Like other artists and writers in Mexico, Modotti was influenced by Mexicanidad, which embraced native cultures and indigenous subjects as part of the larger renewal in Mexican art and culture in the 1920s. This interest is evident in Woman from Tehuantepec. One of Modotti's most iconic images, it became a potent symbol of Mexicanidad and an exercise in photographic modernism. As Sarah Lowe has noted, "the image function[s] like still life, precisely because Modotti chose not just any woman, but a well-known Mexican type - the Tehuana - to photograph. As pictured by Modotti, these women of Tehuantepec were an ideal subject, and provided her with an already-given meaning since Tehuantepec is a matriarchal society, there women have a significant voice in the running of the local economy and politics. Modotti uses the Tehuana to make a powerful political point: that women were capable of independent political action." Artwork description & Analysis: A closely cropped black and white photograph of two hands holding a puppet's strings, Hand of the Puppeteer makes dramatic use of light and shadow, textural contrasts, and isolation of the subject, to produce a carefully composed image that resonates with symbolism. As in her other photographs from this period, Modotti combined the formal rigor typical of modernist photography with her interest in using photography for the betterment of society. Like her avant-garde contemporaries, László Moholy-Nagy for example, Modotti believed that photography was a democratic medium with the power to reach, and ultimately educate, the masses. 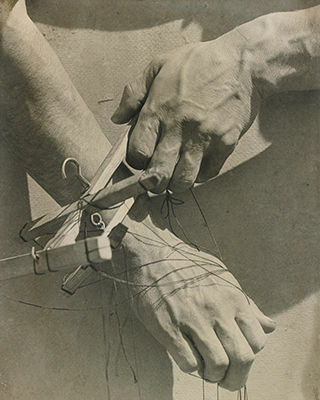 Hand of the Puppeteer is part of a series of photographs Modotti made in 1929 on artists at work. In this instance, she photographed the puppet theater of Lou Bunin, an American artist who was invited to Mexico by Diego Rivera to work as his apprentice. A friendship developed between Modotti and Bunin, who shared interests in the theater and the belief that art should reflect contemporary reality. According to Sarah Lowe, "Bunin . . . had found marionettes an effective means of social commentary." Bunin used puppetry as a means of educating a largely illiterate public. Bunin's use of puppets was also a political metaphor. In this context, according to Lowe, "The puppet controlled from above is a metaphoric description of the asymmetrical power relations between those governing and those governed, a perceptive comment upon the social and political conditions in Mexico in the 1920s, and perhaps on Mexico's relationship with the United States at the time." Hands of the Puppeteer is emblematic of Modotti's belief that through the use of metaphor and symbolism, photography could awaken class-consciousness in the viewer. Indeed, in this images the strings appear cut and/or broken, as though making comment that the time to be utterly controlled by governing powers above is over. Similar to the Telephone Wires, strings that are usually attached are being dethatched and set free. Furthermore, the subject of hands is one that recurs regularly and interestingly, often within the movement of Surrealism. Hands were included in Man Ray's early "Rayographs", as well as in notable works by Dora Maar and Claude Cahun, and as such the view and treatment of this subject widens the reach of Modotti's career beyond Straight Photography.